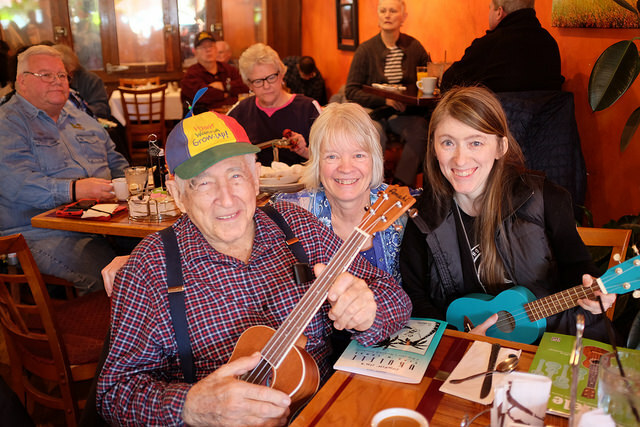 Ukulele circles are open to everyone! Whether you have played for years or are just starting out there is something for you. You don't even have to RSVP, just jump right in. If you have questions please send an email or call 630-434-2480. This is a group for anyone that plays ukulele or would like to learn how to play. Spectators are also more than welcome. We mix it up each month with different tunes ranging from Hawaiian, Jazz, Pop, Rock, Country, and more. A wide variety of Ukuleles, music, and accessories are available here at Uncle Jon's Music! The UJM Family band leads the sessions. Jon, Susie, and Evelyn on Ukulele, Jon Sr. on Steel Guitar, and Jason on Bass. Come play and sing with us! Saturday Morning Meetups at J Fleming’s Absolutely Delicious. Restaurant opens at 8:30 AM for breakfast. Ukulele Circle starts at 9:30 AM. Please support our hosts! Check calendar for upcoming dates and times. Click for photo albums .